The conception of the welfare subject as a self is a twentieth century one. The welfare state, thought of as the public provision of services that make it possible for individuals to enjoy the status of the person, could not have been developed without this idea of the person as a self. Psychoanalysis and psychoanalytically informed ways of thinking placed on the historical agenda the conception of mind as subjective life and a conception of the self understood as a unique centre of subjective life. These ways of thinking exemplified a broader phenomeno¬logical movement in thought (see Varela, Thompson and Rosch 1993). The older ethical idea of a right to self-preservation acquired something that had been missing until now: an account of the subject as an embodied self. 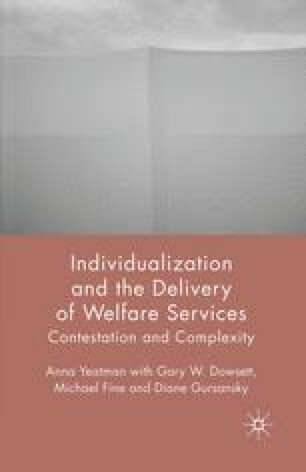 In this framework, welfare services are services that are designed to facilitate and secure the integrity of the individual considered as a unique centre of subjective-somatic experience.